Welcome to Day #2 of Chocolate, Caramel and Toffee Week, as I transition away from three weeks of chocolate items with salt. 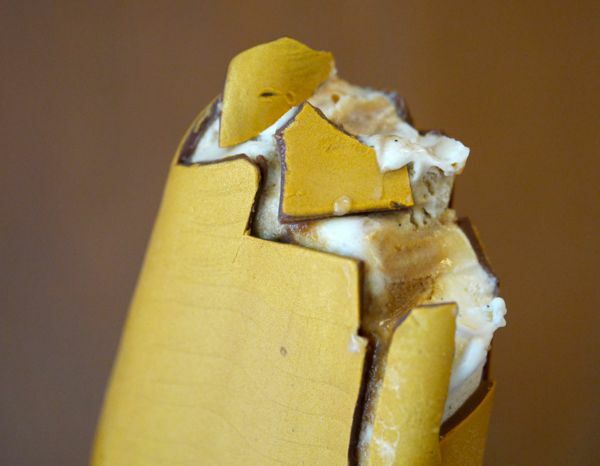 We start this week with an echo from last week's salted caramel series, with today's Magnum Gold!? ice cream bar swathed in a bright, shiny gold wrapper. 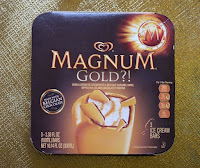 Today's box of 3 Magnum frozen ice cream bars was from Unilever (Englewood Cliffs, NJ). These almost amber-colored bars were described as "vanilla bean ice cream with sea salt caramel swirl, dipped in a golden chocolatey coating." The (Belgian) chocolate,* the inner coating layer, was relegated to a colorful decorative accent color in these stylish bars. 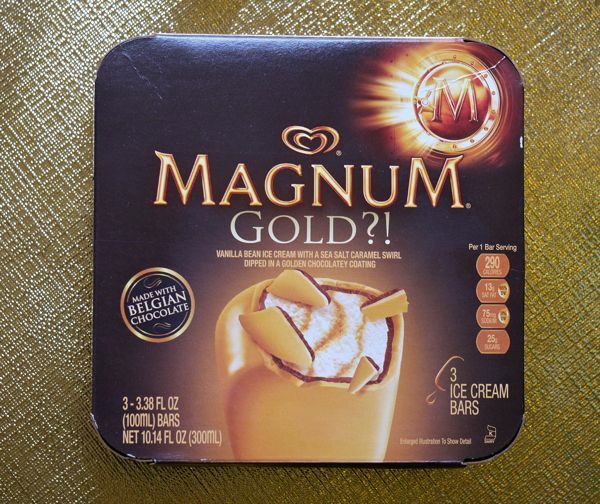 Unilever's Magnum line includes several flavors. One of the first Magnum ice cream bars I had was a "Double Caramel" ice cream bars. The company also offers a Sea Salt Caramel ice cream bar. *These bars were made with Rainforest Alliance Certified Cocoa and Vanilla.